Why STUDENTS should change the face of beauty. Home » Why STUDENTS should change the face of beauty. Over here at Changing the Face of Beauty head quarters we spend many mornings redefining why we do what we do. 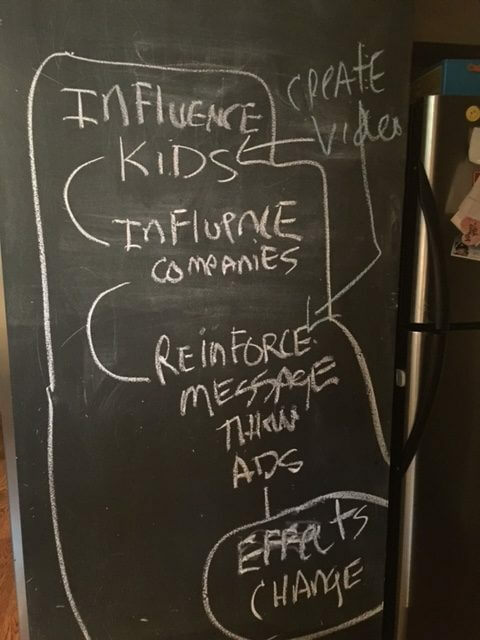 Why are we asking the youth of America to help us change the advertising industry? We scratch our heads and then take a couple more sips of coffee and dig in! We just start brainstorming! Letting whatever comes to mind just spill out all over the kitchen floor (did I just say that? YES! most of the round tables and refinement sessions happen right here in my kitchen!). So today was no different! WHY ARE WE ASKING THE YOUTH OF AMERICA TO SPEAK OUT TO MAJOR ADVERTISERS!?! 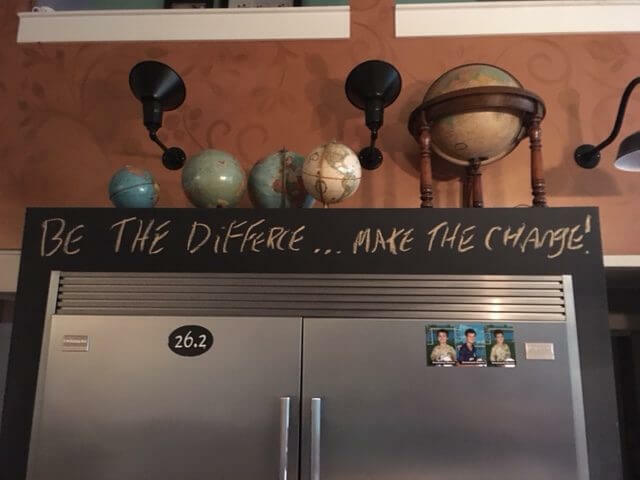 Well it all came together……on the chalkboard next to my refrigerator. We ask because we need them to speak out. They are the influencers! Let me break it down for you. You see it? The youth of America, our students, are the INFLUENCERS! They are advertising, as my good friend, Kelle Hampton would say. Advertisers CARE about what the youth think because the decisions these kids make, set the stage for future advertising decisions! Then, guess what? ————–> follow along….. They INFLUENCE brands! Because brands genuinely care about what the future thinks. They do. They study it! They want to know where these kids put their attention, and their time. They want to know what they VALUE! Cool right? Its the truth! SO lets start again! Our STUDENTS (the INFLUENCERS) create a media piece, i.e. Billboard, Video, Imagery asking that all the students in their school and neighborhood be seen in their favorite retailers advertising. ————> Stay with me! The companies LISTEN! HA! Its true! They listen because our students are INFLUENCERS!! WHY IS THIS IMPORTANT???? ahhhh I thought you would never ask!! It matters because inclusion in ADVERTISING reinforces for the STUDENTS (+ you and I) that the disability community is VALUABLE. Cause guess what? Inclusion in media and advertising absolutely dictate value to AMERICA’s YOUTH! Kids absolutely believe what they see! Get this! DOORS WILL OPEN! Did you hear that? DOORS WILL OPEN!!! Friendships will blossom, employers will hire, colleges will accept, and movies will cast……get the picture? Big changes will happen, because the ad industry will start valuing the disability community as a CONSUMER, a real HUMAN CONSUMER. An industry that just happens to have the LOUDEST voice in the world will make sure our communities know that they value the LARGEST minority in the world, those who have a disability! ARE YOU AS EXCITED AS WE ARE??? Honestly I can hardly contain myself! So this is what we did! Grace and I hopped on Facebook Live yesterday and we challenged 4 middle school classrooms to start this online conversation! (you can watch here) We asked them to create a video and ask THEIR favorite retailer to include the disability community in their advertising campaign! Awesome right??? It gets better! The FIRST 4 classroom videos we receive here at CTFOB we will send 35 youth XL CTFOB t-shirts! So you don’t have much time! Get busy middle schoolers!!!! We want to hear from you! Need examples? Well we have them! YOU ARE THE INFLUENCERS that will effect CHANGE! HEY teachers and administrators! We have a WHOLE program to help you drive this message home at YOUR own school! YEP! You have the opportunity to become one of the FIRST “Changing the Face of Beauty SCHOOLS” Awesome right?? Here is what happens! You screen this program right here! Your students commit to practicing inclusion in ALL they do AND create some amazing content to push out into cyberspace influencing the HUGE advertising voice! YOUR School will receive a spot on our website AND a badge to hang up so that everyone knows YOU teach inclusion all day every day! Something to be proud of! You as an educator can empower your students to change the world by using what they love the most! SOCIAL MEDIA! Teach them how to use that tool to impact the future of not only people living with disabilities but anyone or anything they are passionate about! This organization right here started through a social media campaign! WHO WILL BE THE FIRST SCHOOL? We can’t WAIT to find out! Go Go Go! We are waiting to hear from you!